Have you checked out the wish list page recently? There are lots of goodies over there. I keep going back and forth with the idea of upgrading the wish list section of the blog. It’s not really a wish list (I really don’t need all of those things)… it’s more of an “I like it” list. Would you like me to make full blog posts out of them? I feel like there are so many bloggers that just post pretty things, and you probably don’t need me adding to that. I considered starting a tumblr for this purpose, or perhaps starting a new subsection here that you could read and subscribe to separately. I just have so little time I haven’t been able to work on it! What do you think? Would you like to see the wish list items make it into their own posts, or do you like things as they are now? I love the black and white dress for little girls. 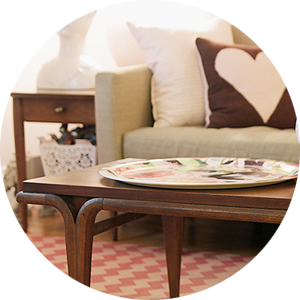 I just blogged about you at my new interior design blog: Honey Sweet Home. I hope you like what I wrote. I would love to see posts like this! Yes, they are a dime a dozen, but I really enjoy them, and I enjoy your style posts, so I know if you did wish list posts they would look really cool. I think it would work if you did a ‘pick of the week’ type post. I think you have impeccable taste, and really like seeing your picks. I know a lot of bloggers do posts of pretty things, but I have neither the time nor the inclination to find lovely new things myself, and it’s great when I find someone with good taste to point me in the right direction! Thanks! I agree with Angie! I love your taste and appreciate your sharing your resources!!! Please keep this up!! THanks! I’m with Angie, too. Mixed in with your other kinds of original content, I’d like to periodically see what’s on your “wish” list. I’d like a few more of thsse posts – just as lonbg as that doesn’t mean fewer ” regular ” posts. Have a super Monday ! I clicked your link and only saw one item. Do I need to click elsewhere? I think a pick of the week would be great. I might be a quick and easy way for you to do more posting, which of course means that I’m only thinking of myself again. I do enjoy your blog! I would like to see more Making it Lovely posts period. =) Love the site! Nicole. I would LOVE to see a section on your blog like this! I check your wish list often and get SO excited when I see that you want something that I have recently bought or is on my own wish list since I admire your taste the most! I would also love to see this as a reg. feature on your blog. I like the earlier comment about a pick of the week….that would be fun! I like things as they are now, but I imagine some of these wishlist things show up in your wardrobe and room mood board posts, and I love those! It’d be nice to be able to click on the picture of the item to go to the link for where we can buy the item. It’s nice to see what you like, but it’d be nicer to be able to know where that item is actually sold! I would enjoy reading short blog posts on the last 5 or so items you’ve added to your wishlist periodically. I wore that jcrew alexa dress as a bridesmaid recently and it really was lovely. I hope to wear it again just for fun! Although I love the stuff that you love, I very rarely look at your wish list page, due to the fact that I follow your blog via RSS. I’d be very happy if you could write regular posts about the objects that you love, but I understand that it’s a lot of work (and none of us want to take you away from Eleanor). Someone above left a suggestion about a weekly round-up, and I second that. i agree with you about blogs posting pretty things. i try so hard not to be that way, but, alas, it happens. I agree with Susan. It might be fun to know why you like certain things, or what you’d have in mind for them if they were in your life. I’d love to hear more about these items! I often find I only have time to read blogs on Google Reader and not go to the actual blog site, so I tend to miss things that don’t show up as new posts. I would love to read posts about things that you like. I agree with you that they are a dime a dozen, but your aesthetic, and how you would use an item to achieve it, is not. I always forget to check out that section of the blog, so something front and center for me would be lovely. I would love to see posts on your wish list items. A lot of us bloggers do post about pretty things (myself included) but I love finding new items and new places to shop so it’s really something I look forward to. Oooo thanks for pointing that out. Love that owl switchplate! I think you should post whatever makes you happy. I’ll certainly read it. ooo fun stuff. BEst of luck at alt! I so wish I could go and meet so many lovely people that inspire me. You will have to share what you speak about here! Your point of view on things is so unique. I would love to see you share things that inspire you. I will read anything you update with. Including things that you like. I also think that you should blog about them! I love your style and have such horrible luck finding things online that I like, but love to see what others find. Especially if it means I get to explore some place new! Firstly, I love your site. As in, everything about it. Secondly, I think it would be fun to incorporate “The Wish List” into blog posts…as long as its balanced, and that’s not all its about! My thoughts are that you have such unique taste and style that your ‘like it’ lists will always be enjoyable but time is precious so…. I think you should change it to “I like lits.” And blog a little alert for us to take a peak when you’ve posted something new. I hadn’t really thought about it, but I like that you post mostly things you have bought or made or altered in your real home. I get carried away reading about and looking at all the cool stuff out there, but so much of it is too pricey, or just not as practical as one would wish it to be. It keeps me from becoming materialistic, and it keeps the blog realistic. I feel like the things you post have passed some sort of test, so I get to see only the things that you feel are worth actually spending the money on, and I get your comments on how they actually end up working or how much you really like them once they’re in your home. The little mood boards you do for different outfits and rooms are enough expounding on the “I like it” theme for me, in fact I think it’s a great and interesting way to present such items. Aside from that, I am fine with checking out your wish list from time to time if I want to see what else you’re digging. I used to read Design*Sponge, but the constant “Look at this! And this! And this!” got old and I got discontent knowing I could never have any of it. It’s probably more my problem than the blogger’s, but I just really like this blog the way it is and I find your real-life ideas to be inspiring, and that’s what keeps me coming back instead of driving me away. Okay, wow, see now I have to agree with this commenter too. I also start feeling a little woe-is-me when I can’t just have-have-have what I see and like all the time. ooh, thanks so much for sharing! I would not mind. I really love your Style posts, so I would like to see more of those. Hi, I would be thrilled if you could tell me where to purchase the pink chair on your wish list..I have been searching for that chair for months!! I’m starting a business and a corresponding blog (completely unrelated to design) and of all the blogs to which I subscribe I think you publish the ideal quantity of posts for my busy WAHM life. I just cleaned up my RSS feeds and got rid of some excellent blogs that I just don’t have time to keep up with. My goal for my own blog is to publish about the same weekly quantity of posts that you put out. 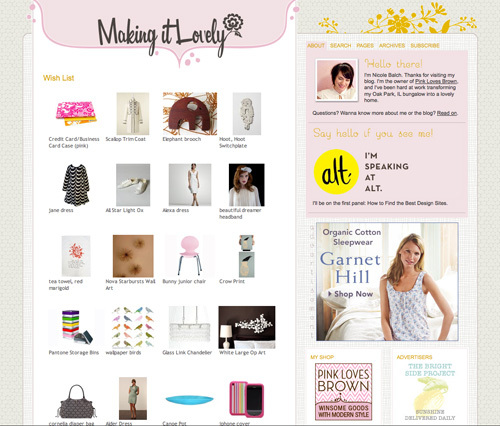 I love that you pointed us to your wish list page (by the way, have you discovered wishpot.com? ), but I think you’ve got a great formula for the quantity and quality of your posts.